Recording vocals, both at home and in studio, is a hard task. Therefore, any help that can be enlisted is more than welcome. Reflection filters are among the singers’ best friends at recording sessions. They help block the background noise and absorb the reflections. 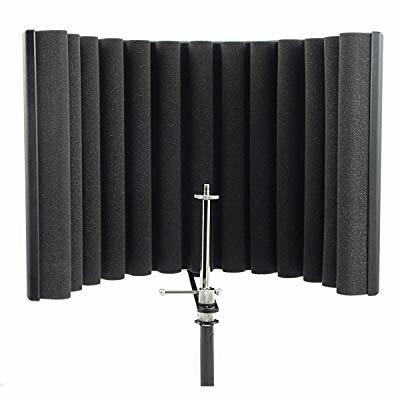 Let’s take a look at some of the best reflection filters that you can use during vocal recording sessions and see what all need to be considered when buying one. Monoprice’s 602650 Microphone Isolation Shield is one of my favorite budget options for microphone protection. Aside from being affordable, it is also versatile and durable. The 602650 is a rather large filter. It is multi-sectional and the outer sections are adjustable. Acoustic foam with pyramid pattern is in the front, and vented metal plate in the back. Also, it is foldable for easier transport. The filter measures 17.3” x 5.5” x 15.4” when folded. This filter is also among the heavier ones, so it might not be the best option if you have lightweight mic stands. It comes with all the hardware you need to assemble and mount the filter. Both a 3/8” threaded mount and a 3/8”-to-5/8” adapter are included in the package. The legs on the bottom allow it to be used for desktop recording, as well. The RF-X is sE’s entry-level version of their popular RF-Pro and RF-SPACE reflection filters. It features specially developed materials which make it significantly lighter than most reflection filters on the market. The sE RF-X is a multi-layered filter. The innermost layer is made of acoustic foam. The second layer is air gap, while the third is made of wool fabric. A composite vented panel completes the setup. 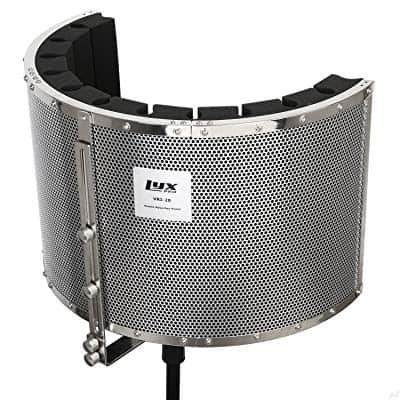 This arrangement helps the RF-X deliver a clean sound with even frequency response. This portable microphone stand filter is height and angle-adjustable. The rigid construction means that it can’t be folded for storage and traveling. Like its more expensive siblings, the RF-X is handmade in sE’s own production facilities. Also, sE recommends to use this filter in acoustically treated recording rooms and studios. Once you get past its outlandish looks, Aston Microphones’ Halo is one neat and very efficient reflection filter. It is a high-tech model with a price tag to match. The Halo is rather big but super-lightweight at only 4lbs. It is made of specially developed PET materials and uses PET felt on the outside instead of a metal grill. The inside has horizontal ribs, instead of vertical ones usually found on conventional filters. 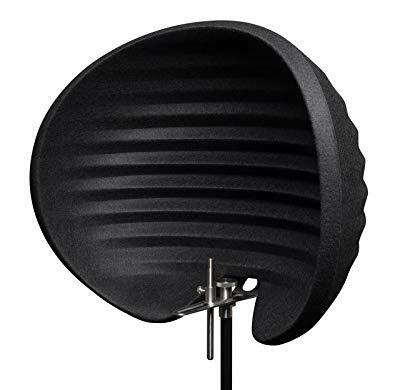 This filter can only be used with mic stands and the mounting hardware is included. The dome shape helps it suppress noise coming from the top and the bottom, as well. The packaging is completely recyclable, while 84% of the filter itself is made of actually recycled materials. Several color options are available, with all-black and gray/purple being the most popular. LyxPro’s VRI-20 is one of the best filters if you’re putting together a recording studio on a tight budget. It offers great value for the price and can hold its own against some of the more expensive models. The VRI-20 is equipped with the classic EVA foam on the inside and a metal grill cover on the back. The foam is thick and offers a good level of absorption. The grill on the back features an adjustable support bar. 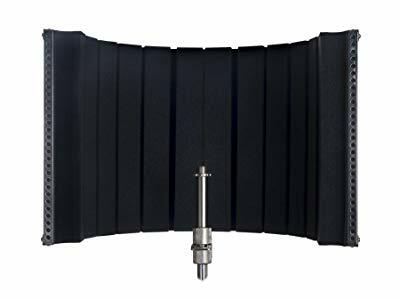 This filter is designed for use with mic stands. However, it is not fit for use on desktops. Note that it is pretty heavy and that you might have to use weights to keep your mic stand in place. Its weight and non-foldable construction make it unsuitable to move around. The AS32 by CAD Audio sits just above the budget class and it is available in two variants – foldable and non-foldable. It is one of my favorite models in this price range and an excellent choice for home recording. This is a sturdy and well-built filter with quality foam on the inside and stainless steel grill on the back. 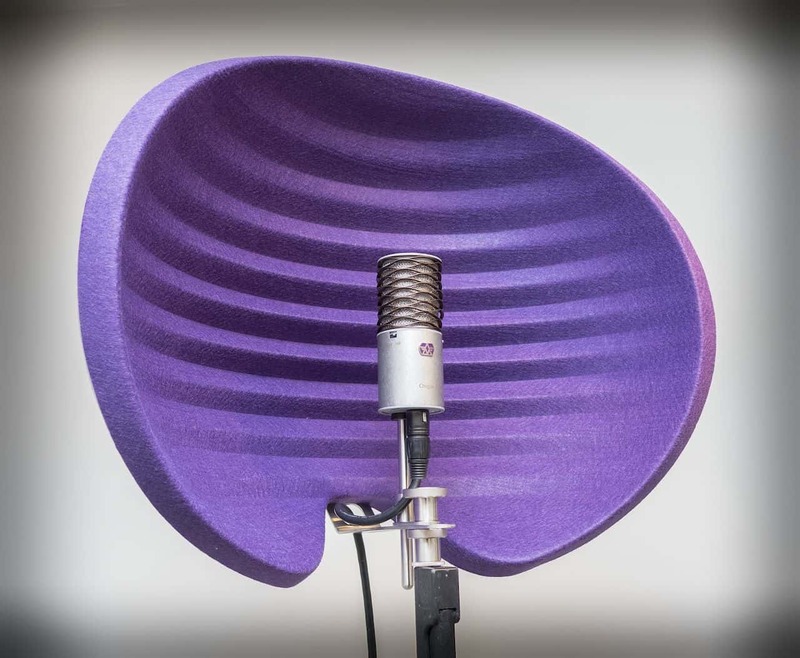 The foam is 2” thick (same thickness as standard acoustic panels), meaning it can absorb a wide range of frequencies. The grill is made of 16-gauge steel. Both the foldable and non-foldable versions of the AS32 are made for use with microphone stands. You can’t use it for desktop recording. Vocal reflection filters need to have both excellent construction and material quality. Most commonly, they are semi-circular and around 1’ tall. Most of them with mounting hardware and 5/8” adapters. Usually, these filters consist of a foam filter in the front and a stiff back cover. To supply the strength, the back cover material is often metal and perforated (to reduce the overall weight). There are also stiff foam filters which do away with back covers. Some models are also multi-layered. The standard foam is of the same grade as the ones used for acoustic panels. Most commonly, the foam pattern is vertical ribs, though other patterns (such as pyramid and egg crate) are also used. When choosing a reflection filter, the size should be one of the most important factors. It should depend on your setup. If you intend to travel for recording, a smaller filter might be the way to go. As a rule of thumb, you should go for a filter which surrounds your microphone in a semi-circle and isolates it nicely from the rest of the room. This is how you can get optimum protection from the reflected frequencies and background noise. If you choose a filter which is too small, background noise and reflections might compromise the quality of your recording. Sometimes, though, you can get away with a smaller one if your recording room has excellent acoustic treatment. The weight can also play an important role. It is directly connected to the size and materials of the filter. If you are recording the vocals in your own home studio, you can get away with a bigger and even massive filter. Park it in the place designated for recording vocals and you’re done. On the other hand, if you have to travel for recording sessions, lugging a heavy filter along with the rest of the equipment might be too much. If this is the case, look for something portable. The thickness of the foam is another important factor when choosing the right filter. As with acoustic panels and bass traps, the thicker the foam, the lower the frequencies it can absorb. Of course, the thickness of the padding affects the filter’s weight and can make it harder to move from place to place. Human voice can’t reach into super-low frequencies. Typically, the male voice range is between 100Hz and 8,000Hz. Female voice goes between 350Hz and 17,000Hz. This means that filters of standard thickness should be more than enough for absorbing the reflections coming from the singer’s voice. Many models feature one-piece construction with limited adjustability. These can, typically, be adjusted only in terms of height and proximity to the microphone and the singer. On the other hand, multi-part models will allow you to adjust the angles of the outer sections. This might come in handy if you want different enclosures for different projects. Multi-part models are also foldable for easier transport. Depending on your rig, you should opt for either a mic stand filter or a desktop filter. The ones for desktop recording usually come with legs on the bottom or are box-shaped. They can’t be mounted on mic stands, but there are exceptions. On the other side, mic stand models usually feature the classic semi-circular design with mounting adapters on the bottom. Most of them aren’t suitable for desktop use. Some reflection filters are designed for both scenarios. They come with legs and can be mounted on a mic stand. If versatility is what you need, you might want to look into this type of filters. Apart from preventing the sound coming from the singer from escaping, reflection filters should also be good at blocking out ambient noise. Background noises such as talking or wind blowing are lower on the frequency scale. 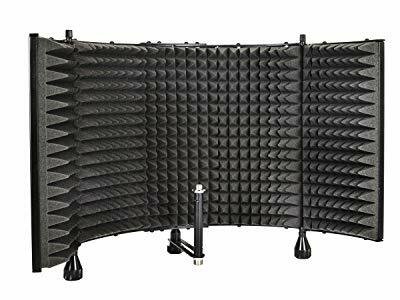 Thus, you either need a filter which is good at blocking out and absorbing low frequencies or you can add bass traps to your recording room. Prices of the reflection filters can vary greatly. While you can find a good and sturdy model for well under $100, some high-end models can cost several hundreds. A good reflection filter can save the day when you’re struggling to nail your vocal tracks. The right choice depends on many factors, such as size, weight, price, efficiency, and more. 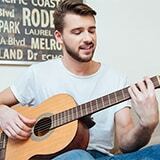 Though far from exhaustive, I hope this article has given you a good idea of what to look for.